It’s now January 2019 and I want you to know I did it. In February 2017 I moto-camped between Adelaide and Melbourne, and I lived to tell the tale. And I only dropped the bike, er, once-ish. As you recall I was in South Australia happily ticking items off my Australia bucket list. There was just one item still outstanding: ride a motorcycle across Australia. And if I liked it, I might do the same once I got back to Canada. With the help of new friends in Willunga, I managed to buy a 1997 Honda Rebel 250cc on Gumtree, borrow some camping gear, acquire maps, and use a couple of bungy cords to strap a massive grey backpack to the rear gear rack of the bike. Over four weeks I rode the motorcycle on a 3250-kilometer loop. I went south to Kangaroo Island, then east on the Coorong, the Great Ocean Road, up to Melbourne, west to the Grampians, north along the Murray River, west to the Barossa, and then south back to Willunga. Along the way I rode lovely roads, met friendly people, dropped the bike on a remote forestry road, came face-to-face with a large spider; and drank wine on a beach—frequently. Riding a motorcycle is fun. Purchasing a motorcycle in a foreign country is terrifying. Luckily, I have had many local angels to help. Jared (my host here in South Australia) pointed me to Gumtree for used bikes. Chris (our neighbourhood letter carrier) told me about Pickles Auctions for postie bikes. Brett (an experienced Harley biker) offered gentle support and helped me find my Honda Rebel. Another help is that I speak the local language—albeit with a Canadian accent. Travel Tip: If you learn how to order a beer in another language, know how to ask for the toilet. If you’re an international traveller, you know how important this is. It’s near impossible using body gestures to ask where the toilet is. If you speak the local language, you understand the words on local websites. You can phone and speak with local sellers almost fluently. You can phone government call-centres and come close to deciphering their requirements. I am now the owner of a 1997 Honda Rebel 250. It’s got a mere 45,900 kilometres on it. It came with all the riding gear I could need: a full-face helmet, DriRider jacket, Draggin pants, gloves, boots, saddlebags, a gear rack, and much more. And they all fit because the previous owner was the same height and shoe size as me. I’ve got six weeks left in Australia. Kangaroo Island, the South Ocean Road, the city of Melbourne, Tasmania, the Flinders Ranges, and the state’s campgrounds await. That’s the exciting part. The scary part is waiting to hear back from the bank…where I applied for an account…so I can register the bike with the South Australian government…so I can ride it safely and legally. It’s driving me crazy, but this is the kind of test we travellers face when we feel the fear and do it anyway. 1997 Honda Rebel 250 motorcycle in South Australia. I wore a skimpy dress, a floppy hat, sunglasses and a big grin. With one hand I guided the handlebars of Ruth’s sidewalk bicycle. A sunflower perched cheerfully in a faux wicker basket hanging off it. With the other hand I balanced a blue wine glass. It contained a mimosa cocktail of sparkling wine and orange juice—until I used that same hand to shift into a higher gear. Thousands of spectators lined either side of the McLaren Vale Main Road. They waited for the team riders of 2017’s Tour Down Under to wheel past in a mass of muscle, metal, and resin. In the meantime, they had me. They hooted and then cheered when I tucked in for an attack. I pedalled past Michelle’s gang who drank bottles of Moondog’s White Feather Fizz and twirled painted umbrellas every time the peloton of athletes blew past. Painted umbrellas at the Tour Down Under 2017 in Willunga, South Australia. Once I got onto the High Street, things got a little technical. I had to practice my slow-speed pedal as hundreds of Lycra-clad road riders suddenly joined then passed me on the road. They were regular road cyclists, on the course to glide in the slipstream of the greats—Ewan, Porte, Chaves. They looked fast and wealthy in team-style jerseys and ultra-light bikes. Some laughed when they passed me and I raised a glass to them. One scowled and swerved when he passed me after I signalled a left turn. Just like a roadie, I thought. Too busy watching his front wheel to see a few metres ahead of him. I started pedalling up the Willunga Hill with the rest of the cyclists, still holding my wine glass. “Why, this isn’t so hard!” I remarked to a man on a Trek. He grinned and kept pedalling. He would join the other cyclists on the shoulders of the winding, 3.7-kilometre hill. It would mark the Tour’s Stage 5 finish. I’ve staffed a bike shop, worked for a bicycle designer, written about cycling culture, presented slideshows, been a sponsored rider, and solo-cycled several countries. I’ve also ridden a bicycle all my life. When people ask me when I started riding, I tell them, “I never stopped.” When they ask if I ride for the environment, or for fitness, or to save money, I say no. I ride for fun. Road riding is great, but I think it’s all just so earnest and serious. And expensive. And corporate. Me, I raise a toast to the people of South Australia who add a little fizz and ridiculousness to cycling’s Tour Down Under. Ulrike and Meme raise a toast to the Tour Down Under 2017 in South Australia. I am a meat eater. I eat kangaroo and I eat bacon. I eat whatever is indigenous to the culture I am visiting. This morning I ate fake bacon. It was my first time. That’s because I’m staying with an Australian family that is variously meat-free, gluten-free and dairy-free. Two of them left the house this morning for a two-week sojourn. I faced a kitchen of intriguing leftovers including bacon-style rashers. If these brown slices of spongy food product look, smell, or taste like meat, it is a category of meat that us actual meat-eaters would compare to SPAM. Which many of us don’t actually eat. And in a similar line of logic, why would a vegetarian want to eat something that looks, smells, and tastes like meat? I’m the first to acknowledge that meat tastes like dead animal. On top of the deadness, you have the salts, fats, and preservatives that meat flavour entails. I’m guessing we have bacon-style rashers so the young ‘uns get a little non-meat protein in their diet. It’s a food novelty. For others maybe it’s intended as a kind of methadone for meat-eaters—a way to slowly withdraw from the addictive deliciousness of salty, smoky bacon. On a positive note, I took three fresh, organic eggs from our backyard Isa Brown chickens. I cracked the shells and slid the unfertilized embryos into salted boiling water. I enjoyed them on toast alongside the vegetarian bacon-style rashers. Isa Brown chickens in South Australia. Today I sighted my first classic Holden ute. Then I got to ride in one. The first time I ever heard of a ute (a utility coupé automobile) was in church. Delilah and I had gone to the Christmas tree festival at the Willunga Uniting Church—the same community that organized a Blue Christmas service for people not happy about the holidays. On a scorching summers day. “What’s a ‘Holden ute? '” I asked Delilah. The five-year-old looked at me as if I’d just asked what colour the sky is. “It’s a kind of truck,” she responded. Fast forward to today, in the yard behind the 21 Junk Street café in Yankalilla, South Australia (map). I’ve finished my healthy lunch and have wandered out back to use the toilet. What’s that? Why, it’s a beaut of a ute. I know because it says HOLDEN in block letters. The car, er, truck is elegant and streamlined and it reminds me of the 1970s-era Chevrolet El Caminos I’ve seen in North America. Detail of a Holden ute (coupe utility) vehicle in Yankalilla, Australia. Holden is an auto manufacturer that started as a saddlery in South Australia in 1856. It moved into the automotive field in 1908 and became a subsidiary of General Motors in 1931. Later in the day, Ruth drops me off at Scott’s place in McLaren Flat for a visit and a tour of his studio. We have a beer next to his pool and he asks if I want to join him and some friends at The Willunga Hotel (“the middle pub”) for Happy Hour. Sure, I say. We walk around the corner and there is pretty well a carbon copy of the ute I saw in Yankalilla. “Climb in,” Scott beckons, “But the seat might be a bit wet.” I get in the ute and it feels like—a car. I look back. It’s the payload of a hard workin’ truck. It’s the mullet of cars, I say to myself—It’s business out front and a party in the back. Happy Hour at the Willunga Hotel (the “middle pub”) in Willunga, South Australia. First, the heritage building (a bakery in 1886) is neatly positioned at the foot of the daunting Willunga Hill. The long, winding hill is challenging enough to be part of the route for the annual Tour Down Under road bike race. Many MAMILS (Middle-Aged Men In Lycra) pedal up the hill on their road bikes. Sometimes they pause here for a fuel stop and I get a chance to chat with them. It’s kinda fun because I’ve worked and written on the bike industry and know more than the average gal about cycling; but they wouldn’t know that looking at my borrowed Fluid sidewalk bike. Second, owner Bec is friendly as could be and she’s included bicycles as part of the outdoor decor. Bec, owner of La Terre Cafe and Bar in Willunga, South Australia. They’re clunky old mountain bikes, but Bec’s painted them in festive colours, perhaps in the spirit of the Tour. In fact the entire village of Willunga will dress up cycle-style when the Tour Down Under rolls though Willunga January 21, 2017. Third, La Terre serves a fantastic, all-day breakfast. There’s a wonderful chef/baker in the kitchen who concocts a hearty, meaty “Farmer’s Breakfast” that includes bacon, sausage, greens, grilled tomato, mushrooms, potatos, eggs, toast and a marvelous sweet tomato chutney. Farmer’s breakfast at La Terre cafe in Willunga, South Australia. It’s a breakfast I can count on to sustain me when I roll out in the 40-degree Celsius heat for a practice-run of cycle-touring South Australia later this month. It started with coffee at the Old Post Office. It ended with a python snake wrapped around my neck. I was sipping wine with my new friend Mémé at a nearby cellar door when we got chatting with Leith and Sue at the next table. Leith is Willunga’s village postmaster. He told us and Sue moved into the historic Willunga Old Post Office and Telegraph Station earlier in the year. They invited us to join them for a coffee and tour of their heritage home the next day. The Old Post Office in Willunga, South Australia. A second-floor door leads nowhere, while a window next to it is blocked in. While Leith made coffee, Sue led us through the 160-year-old building and pointed out odd features. For example, the City council at the time taxed buildings according to how many windows they had. When it came time to build an addition for the new telegraph station, the builders added a large glass doorway, but blocked in a window space next to it. Apparently, you didn’t get taxed for doors. The four of us settled into the front verandah and Sue and Leith started telling hilarious stories about their days as tour guides and hosts in Adelaide. Leith disappeared and then reappeared with tall flutes of sparkling red wine. Sue, Ulrike and Leith at the Old Post Office in Willunga, South Australia. After the second or third bottle, Leith brought out a tray of local cheeses, home-baked crackers, and his very own quince chutney paste. He told us he named it “Black Ninja” after his little black cat. Leith makes the quince in small batches, and local wineries snap it up to offer at their own cellar door tasting rooms. Meme with Leith’s Black Ninja Quince Paste at the Old Post Office in Willunga, South Australia. I told a few stories of my own and when Leith heard me say that I’d like to get on a motorcycle to sightsee South Australia, he made a call. A few minutes later Brett arrived on his Harley-Davidson and asked if I wanted to go for a ride. Did I? Ulrike on Brett’s Harley in Willunga, South Australia. I jumped on the back and Brett roared us out of town, along the winding B34 to Myponga (map), and then north along the coastline back into Willunga. When we landed I asked Brett what our top speed was. 160 kilometres per hour, he answered. It was nearing 5 pm and Mémé begged off our spontaneous dinner plans, saying she needed to be elsewhere. Leith told us it was “Rump and Red Night”—a roast beef dinner with a glass of wine for $18. Brett whipped home and reappeared at the pub with a gift bag for me. I opened it and gingerly pulled out almost three metres (nine feet) of snake skin. “I thought you might like it,” Brett grinned. “My Inland Python shed it.” Brett does welding, trailer repairs, and building maintenance. It was beautiful. I gently looped the snake once, twice, three times around my neck like a boa scarf. Brett promised to help me find a motorcycle of my own and we all settled in for a social dinner. Biker Brett at the Old Bush Inn (the “top pub”) in Willunga, South Australia. I met Mémé my first week in Willunga. It was an opening for Aboriginal artist Gavin Wanganeen at Willunga Gallery, mounted at Hardy’s Tintara Cellar Door (winery). Mémé Thorne is a well-established actor in Australia. She’s also an arts enthusiast, and at the Wanganeen opening she promised she’d introduce me to life in the area once she got back from a hiking expedition in Asia. New Year’s Day I received a text from Mémé. She wanted to know if I was ready to visit some winery cellar doors to ring in the new year? I said Yes and she arrived in 15 minutes. I climbed into Mémé’s custom-plated Honda and we headed to Avril Thomas’s Magpie Springs. Avril made us coffee and opened the gallery space just for us. It’s currently exhibiting Small World, a collection of 240 postcard-sized works by 200 artists from around the world. The show closes January 15, 2017. Small World, curated by Avril Thomas, owner owner of Magpie Springs in Willunga, South Australia. The works are an even mix of local and international artists working in water colours, oil, acrylic, pencil, mixed media, and other media. It includes a beautiful piece by Avril Thomas, herself a portrait artist. Paradox, a 4×6-inch portrait by Avril Thomas, curator of Small World and owner of Magpie Springs in Willunga, South Australia. Avril toured Mémé and me around the property, including her studio. There she showed us all the envelopes that the small works arrived in, including a stamp-covered envelope from the USA. Avril Thomas, curator of Small World and owner of Magpie Springs in Willunga, South Australia. Magpie Spring’s cellar door was not open for business, but Avril did show us a surprise in the corner of the property: an impressive bouldering/climbing wall. I used to live with a climber, and Devin would have been smacking his lips at this wall. Climbing and bouldering wall at Magpie Springs near McLaren Vale, South Australia. We did a sticky beak at nearby the K1 Geoff Hardy Wines cellar door but they were closed for New Year’s Day. The Cube, a venue structure at D’Arenberg cellar door and winery near McLaren Vale, South Australia. D’Arenberg wasn’t open either, but Mémé recommended I return there with someone willing to buy me a posh lunch. We had better luck at our next two stops. Coriole Vineyards‘ terrace restaurant was hopping and I was able to catch a few tastes of Coriole’s rosé and Fiano—an Italian-style white wine I hadn’t heard of before. Coriole Cellar Door winery in McLaren Vale area, South Australia. A few vineyards over, we parked under a tree at Samuel’s Gorge winery, named for the serpentine Onkaparinga Gorge that it perches over. It was busy here too, but I managed to sample a few reds including their Grenache, Tempranillo, and Mourverdre. Staff pouring tastings at Samuel’s Gorge cellar door and winery in McLaren Vale area, South Australia. Ready for a snack to accompany our next tasting, Mémé and I rounded off the day with a garden table at Red Poles (Brick Kiln Shiraz). It’s a woody, funky, relaxed place with cheese and paté platters and a very tasty sparkling Shiraz. Ulrike and Meme at Red Polles winery near McLaren Vale, South Australia. As we chatted and chewed, Leith from a nearby table came over to say hello. He introduced himself as the Willunga Postmaster and said he and his partner Sue lived in Willunga’s old Post Office and Telegraph building. He invited Mémé and me for coffee the next morning and we gladly accepted. The Hart Road Wetlands in Aldinga, South Australia. I’ve also been watching kangaroos. Every day at dusk, I could see them hop in the grasses in the Hart Road Wetland. Today I took a walk through the adjacent Aldinga Scrub Conservation Park and took a few photos. I found myself following kangaroo trails instead of park trails (which were grown-over and unmarked anyways). I could quietly stand and watch a kangaroo mum massage her pouch where a young joey might hide. Gum tree stump at Aldinga Scrub Conservation Park in South Australia. Lichen Coral trail in Aldinga Scrub Conservation Park in South Australia. For me as a visitor, it was a nice contrast to the Mount Lofty Botanic Garden which I’d visited with Jared and his family the previous day. Picture frame in Mount Lofty Botanic Garden near Adelaide, Australia. Jared’s Toyota wagon rolled to a stop at the foot of a bumpy dirt road in the heart of Deep Creek Conservation Park. This was us stranded in the middle of a remote Australian national park with no transportation and no mobile service. We’d spent the morning exploring the Heysen Trail and had been looking forward to another scenic walk. Jared turned the key a few more times, got out and tightened the battery contacts, checked the starter motor, and then looked at the engine ruefully. A young guy in a white T-shirt walked towards us on the dusty road. He asked if we needed any help. “Are you a mechanic?” I asked hopefully. “Nope,” he laughed, “I’m a paramedic. I can fix broken bodies but not broken cars.” He told us he was staying with a group in the nearby Tapanappa campground. He offered to ask his friends if anyone could help. After he left, several vehicles drove by also asking if we needed help. One of them was a huge four-wheel-drive, all-terrain recreational vehicle. By that time Jared and I had absorbed the fact that we were stranded. At the park gate Jared used his mobile phone to call the RAA (Royal Automotive Association) and then his partner Ruth (who was busy getting a family dinner together). Inside the truck I shared stories with Colin and Mia about my solo travels by bicycle. Jared and I looked at each other. “Sure!” we said almost in unison. Mia handed down a couple of Asahis and wished us well. Alone at the car we assessed our situation: we were stalled in front of a campground with toilets and fresh water. It was overcast and not hot with plenty of hours of daylight remaining. We had beer, snacks, maps, and the world-class Heysen Trail nearby. “Well,” said Jared, “What do reckon we go for that walk after we finish our beer?” I laid out a towel, leaned back on a tree, took a swig of my beer and nodded enthusiastically. Heysen Trail marker near Tapanappa Lookout in Deep Creek Conservation Park in South Australia. The walk was beautiful, with peeks of the St. Vincent Gulf oceanside and kangaroo families inland. Kangaroo under gum trees on the Heysen Trail near Tapanappa Lookout, South Australia. The tow truck was a massive flat-bed truck. Its driver, James, was a mechanic. He guessed that the problem was the timing belt—a problem he could not fix on the spot. After some discussion Jared agreed to James loading the surfboard-laden Toyota on the back of the truck, hauling it to the Yankalilla Towing yard, and then dropping us and the surfboards off at the Yankalilla pub. Jared’s dad Darryl would drive in from Willunga to pick us up from there. Flat bed tow truck from Yankalilla Motors in Deep Creek, South Australia. I climbed up the steep steps of the truck cab and settled in on the bench seat between James and Jared. James steered the truck along the corrugated dirt road and out of the park. As he and Jared compared surf beaches, I took in the gorgeous, rolling agricultural views from the heights of the cab. We passed hundreds of kangaroos relaxing in hay fields. A double rainbow hung over Sellicks Hill. It was beautiful and I felt like I was flying. Later, Jared and I thanked each other for remaining calm as we worked through the day. He was optimistic that his mechanic wouldn’t charge him for the timing issue because it was part of the work he gone done. I’ve been in Australia for six weeks and in that time my host has shown me plenty of gorgeous coastlines. I had no doubt this would be another. We stopped for a savoury pie and ice coffee in Victor Harbour and then followed the twists and turns of Highway B37 into Newland Head Conservation Park. Jared steered the Toyota hatchback onto Waitpinga Road and then into a campground. At 1,200 kilometres, the Heysen Trail is Australia’s longest walking trail. It starts in Cape Jervis (the ferry pier for Kangaroo Island) and stretches east and then north towards the Flinders Ranges, ending in the Parachilna Gorge east of Lake Torrens. It’s named after Hans Heysen, a German-born Australian artist. Jared led me onto a boardwalk trail over sand dunes. We walked and talked about how plants and traditions were both different and similar in Canada’s and Australia’s indigenous cultures. At the crest of a hill, we paused and looked out. The sea sparkled and the rounded slopes of the land seemed to melt into the blue. The edge of the Great Australian Bight began just west of where we stood. According to The Wilderness Society, the Bight is threatened by BP (British Petroleum). The multi-national wants to drill for oil and gas in these waters as they did in the Gulf of Mexico. That installation in the southern USA caused a devastating oil spill disaster in 2010. Later that day, the Toyota wagon would lead us to more of an adventure than we anticipated. Heysen Trail in Deep Creek Conservation Park in South Australia. “What is a Ned Kelly pie?” I asked the server at Beck’s Bakehouse. “It’s a meat pie with an egg on top,” she shrugged. “Who is Ned Kelly?” I asked Jared. We were seated outside the Port Noarlunga bakery café with his daughters Tilly and Delilah. “But why did they name a meat pie after him?” I pursued. I looked around from Jared to Tilly to Delilah. They sipped their juice. Back at the house I used my brand new Onkaparinga Library card to secure a DVD of the 2003 feature film Ned Kelly. It stars Heath Ledger and Orlando Bloom. Jared and I watched the film and I learned—through the lens of Hollywood cinema—that the real Ned Kelly drank horse blood, hid in the Wombat Ranges, wore a suit of armour, and fetched a reward of £8,000 for his capture. Enough citizens of the time resonated with his Irish-Australian idealogy that more than 30,000 of them petitioned for his release. We did, but my meat pie question remains unanswered. I feel lucky to have met a kindred spirit. We, like many others, must live through a blue Christmas. S. lives in Adelaide. Her 31-year-old son died in October. I’d never met her before, but when I saw on Facebook that she would be in the area with a bicycle, I offered to pedal the nearby Shiraz Trail cycling path with her. It’s an old railway bed that’s been converted into a paved bike and walking trail. There are many wineries nearby. Unfortunately and as I’ve found in the past, the winery we aimed for was closed and two others were about to close. No worries. We aimed for a café in McLaren Vale town, ordered pizza and wine, and shared our sentiments about Christmas. S. has the support of her family and spirit community and so she seems to be doing okay. She has a lot of wisdom and is taking things moment-by-moment, day-by-day. Me, it’s been thirteen years since my boyfriend P.H. chose to kill himself. His birthday was December 23 and he started feeling low around this time of the year. Like S., I had to learn how to live again, minute by minute. I had to tolerate the months, weeks, days leading up to Christmas. The dead joy of Christmas. To survive, I learned that I can mostly escape it by flying to foreign countries. It started with Baja, Mexico, then led to winters in India, France, and this year—Australia. Being a writer and blogger, I also shared my story in a blog called You Are Free – your suicide, my story, in 20 parts. It felt right, and I wanted other people to know that they’re not alone when they, we, feel sad with the world. S. and I talked about all this openly and honestly, and it felt like a blessing. I had planned to attend the Willunga Uniting Church‘s Blue Christmas service on December 21. But having met S. I feel the peace and companionship I might have found at that gathering. Nonetheless, I feel grateful that this little village church would do such a kind thing as to call a service for those of us who face a blue Christmas. Wild flowers and thistles at the side of the Shiraz bike trail. You don’t have to believe in God to see the tiny bits of beauty all around. However, as a Canadian visiting one of South Australia’s nascent wine regions, I say that a cellar door (winery tasting room) is a place you can cycle to, sample wine, get back on your bike, pedal about 200 metres, and repeat. In McLaren Vale, you can visit more than 75 winery cellar doors within a a few miles’ radius. This includes Red Poles winery, Wirra Wirra Vineyards, Hugh Hamilton Wines, Primo Estate, Salopian distillery, Leconfield Wines, and Pirramimma Wines. I found this was true with McLaren Vale’s McMurtrie Mile a few days ago. It’s a rural road with a number of very eclectic cellar doors. My host Jared and I didn’t linger at any because, mysteriously, these cellar doors close in the ideal wine-sipping and tapas-tasting hours between 4 and 6pm. I find this confusing as we in Vancouver have passionately taken to this time we call happy hour as an ideal time to have a glass before you head home after work. But maybe that’s just me. To prove I am no weekend pedal-pushing sissy, I cycled up the Willunga Hill on a borrowed mountain bike. It’s a 250-metre ascent over 3.7 kilometres—challenging enough to be part of the route for the annual Tour Down Under road bike race. Queen of the mountain: the crest of the Willunga Hill in South Australia (map). I continued north along the paved, roll-y Range Road and then pointed the bike down a narrow laneway called the Kidman Trail. It was a steep gravel descent, but signs alerting me to the presence of koala bears kept me attentive. Finally, I rolled onto the paved roads of McLaren Flats. The nearest winery was Kangarillo Road Vineyards and Winery and I had just thirty minutes before the clock struck five. At the winery I quickly discovered that a “cellar door” is not a musty, rusty place with old barrels and cobwebs. The Kangarilla tasting room was positively arty. Cellar door tasting room at Kangarillo Road Winery. I sampled a rosé with strawberry and poached pear notes, a Pinot Grigio with hints of coffee and fresh cut grass, a Duetto with aromas of citrus marmalade and crystallized ginger, and settled on a glass of ‘Street Cred’ Moscato suggesting ripe pear and Turkish Delight. After pouring me a very generous glass of the sweet white wine, the cellar door staffer invited me to relax on the sun deck while she and her colleague packed up and went home. I availed of her offer and spent the rest of my “happy hour” slowing savouring Moscato until the wind picked up and pushed me to dinner. “Bernard salt can pry my smashed avocado from my cold dead hands” tweeted Simon Xmarse. “Skipped smashed avocado for breakfast this morning. Excited to buy a house next week.” responded Tony Broderick. As a visitor from the hipster neighbourhood of Mount Pleasant in Vancouver, Canada, I have mixed feelings about this. I’m a foreigner who really likes avocados, especially for brunch. At home it’s a treat you might see next to your eggs benny—two or three slivers of avocado alongside your heritage tomatoes and organic yams. It will not be cheap. Here, it is a part of an admittedly expensive brunch, but that price tag includes tax, and there’s no tipping. I admit I may be a mature hipster. But I also own an apartment with a paid-off mortgage. Does that make me a Moralizer (as Salt puts it) who is entitled to eat over-priced avocado breakfasts as I look down my nose at younger people who share my love of smashed green stuff on grainy toast? It’s a trivial topic at first pass, but it touches on an issue that is huge to cities such as Sydney and Vancouver: housing affordability. Hard-w0rking people can’t afford to buy a home because global market issues—foreign investment, aggressive developers, slow-moving policy-makers, and Airbnb greed—are sucking it out of their hands. These are the same hands that merely want to enjoy an open-faced vegetable sandwich. Today I settled on a compromise: a couple of ripe, New Zealand avocados from Coles (two for $5 AUS); scooped out with a round spoon, piled on multi-grain bread moistened with Nuttelex, and sprinkled with a tasty spice mixture. A salt mixture, to be exact. I miss out on the hipster bistro culture here in the kitchen (sorry Jared and Ruth), but I do get to defy Salt and his posse of Moralizers in my own, rebelliously East Van way. Ice? Check. Beer? Check. Chicken and sausages? Check. Barbie? Fire it up. It’s Sunday evening and my hosts Jared and Ruth tell me they’ve invited some friends over for a barbeque. Naturally, we’ll need some ice in the Esky (portable cooler) to keep the Coopers (pale ale) frosty. Jared preps the retro grill, Ruth marinates the chicken, I sweep the shed (covered patio area), Delilah wipes the kids’ table, and Tilly tunes her guitar. There’ll be three little kids running around, three guitars jamming, one dad bongo-drumming, a backyard fire burning, stars twinkling, and me pushing twigs into the fire and quietly taking it all in. Jared Thomas grills up some chicken skewers on the barbie at home in South Australia. I imagined that if I arrived at the Adelaide Biplanes aerodrome on a bicycle in a breezy summer dress, I could flirt with a pilot and sweet-talk my way into his cockpit. That didn’t quite happen. I did cycle a few kilometres from McLaren Vale to the airfield and museum, and I did scan my radar for pilots, but the place was quiet and none were to be found. Instead, I ordered a thick coffee milkshake and watched a small plane practice taking off and landing from the comfort of the airfield’s vintage-themed café. I was grounded this time, but rumour has it Santa Claus has logged a flight plan with the tiny airport. Maybe I’ll bump into the big fella next time around. Cafe and museum at the Adelaide Biplanes airport near Aldinga, South Australia. Rangoon, Burma was home to a community of Goan families before WWII. That included my father Leo Rodrigues and his cousin Aloysius D’Souza. They were born in Rangoon and were age six when the Japanese attacked the city a few weeks after they bombed Pearl Harbour. Leo and Aloysius and their families had to flee Rangoon by rail, sea, and land. Our families arrived safely in Calcutta port and trickled back to Goa via Delhi and Bombay. Two years ago I flew to Goa, India to work on my own book based on my Girl Gone Goa blog. I felt compelled to put it on pause because I wanted to edit a memoir that Aloysius had drafted. I couldn’t help but get caught up in his stories of community, music, food, farm life, and war. Today I received word that Uncle will celebrate both the publishing of his book and his 83rd birthday in Goa this week. I’m in Australia now and I feel like just one small ocean separates me from him. But a travel agent tells me a return flight from Adelaide would cost $1900.00 AUS and a visa would be impossible to obtain. Publisher Frederick Noronha of Goa 1556 tells me I’ll receive a copy of the book shortly. But I feel sad I can’t be there with my talented, story-teller uncle. My great grandfather Sylvestre D’Souza left his family in Goa to join the gold rush in western Canada. Aloysius’s book describes how Sylvestre remained in Canada for many years, leaving his wife to care for their three children Anju (Aloysius’s father), Bemvinda (my grandmother), and Gerry on her own following WW1. I first heard mention of toasties at our night of camping in Wirrina Cove. this morning I cycled to the neighbouring village of McLaren Vale to buy some sensitive-teeth toothpaste that doesn’t cost 22 dollars (as I was shocked to discover at the Willunga local pharmacy). I stepped into Country Cup and ordered a long black with milk and a ham-and-cheese toastie—my first! I found it was similar to the North American grilled cheese sandwich, but without the grilled part. I could have asked for some sauce (ketchup) to go with it, but I was happy to nibble this tasty bit of brekkie tucker with my coffee. Chillax is a wax that you dot on the top side of your surfboard. It’s designed to offend sharks. It’s organic. According to Chillax’s Common Sense Surf Company Facebook page, Chillax Wax is “…heavily dosed with four organic essential oils and four strong spices.” I spoke to the inventor of the wax at the weekly Green Light Eco Market. He hinted that one of those essential spices is chili pepper. Me, I’m just learning to surf so rest assured I’ll stay in shallower, less-shark-infested waters. And I can’t help but think the wax looks like a creamy, custardy, and spicy crème brûlée. Chillax organic shark-repellent surfboard wax looks tempting as crème brûlée. Does that make me a shark…? “Chillax is an ongoing project of investigation and innovation; but with the help of consumers and supporters it will be made redundant by our second envisioned product – a shark repelling surf wax. Here’s a traveller’s tip if you stay in a place for a month or more: Get a library card. It’s usually free. You can borrow guidebooks, novels, maps, and movies. You can pick up useful local knowledge like events calendars, newsletters, and volunteer opportunities. And you can chat with friendly librarians like the lady at the Willunga branch of the Onkaparinga Public Library. She told me all I needed to earn my own library card was have my hosts Jared and Ruth write a letter. Ruth was kind enough to sign the letter I pushed in front of her this morning. The public library is a great place to pick up events calendars for the area you’re staying in. Grab a Spring/Christmas events calendar at the Onkaparinga Public Library . “Is that an…onion?” I ask Ruth, beckoning to a bush in her backyard. It’s a huge growth of lily-like leaves but with incongruous, onion-like flower bulbs. Hers haven’t bloomed yet, but later that day I discover a border of Agapanthus guarding the olive grove at The Farm winery and café in South Willunga. Agapanthus flowers in various stages of bloom near an olive grove at The Farm cafe and winery in South Willunga, Australia. 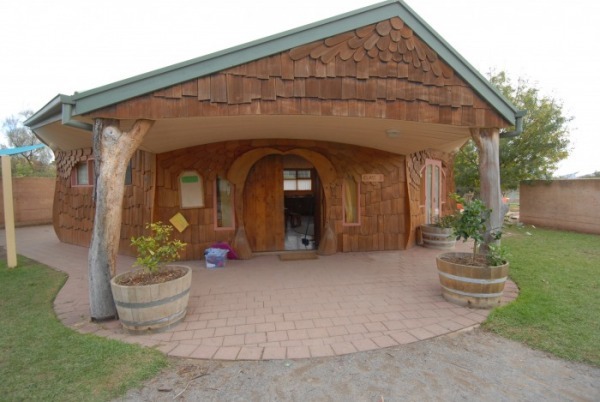 Tilly is in Class 8 at the Waldorf School here in Willunga. It’s an unusual school, where 13-year-olds discuss personal journeys, portrayals of women in advertising, and 9/11 conspiracy theories. It also includes a high degree of musical competence. The event showcased everything from percussion poles to xylophones to classic guitar. A piece by the Senior Band, Kaze no Toorimichi, felt transcendent. During the break I wandered the school grounds and got a sense of the Willunga Waldorf School’s radical building and grounds design. From what I’ve seen so far, and having spent some time with Tilly over the last couple of weeks, I’m impressed—and just a bit jealous. I wonder how my generation would have turned out if we could have received this kind of creative education? The temperature went down to 8 degrees Celsius for my first night of camping in Australia at Wirrina Cove Holiday Park, south of Adelaide. Luckily, I got to sleep inside a real live swag. A swag is a canvas bedroll. It’s heavy and waxed and includes both a zip-over mosquito net and a cover. Ropes at either end allow you to tie it to a tree, or like a bivouac sack or camping hammock. Or you could make like a jolly swagman and pitch it under the shade of a coolibah tree. √ Sleep inside a swag. I want to ride a motorcycle in South Australia. The roads wind beautifully along picture-postcard coastlines, through vineyards, and between mountain ranges—how could I not? The trouble is, I need a bike. It’s got to be small, light, ready to carry gear, and less than $2000 AUS. A few people have suggested a Postie bike. Similar to my vintage-style Symba Honda Cub, the Australian Post’s delivery vehicle of choice is small (just 110cc) motorcycle that is nimble, easy to operate, and tough as all get out. Today I caught sight of a Postie zipping in and out of drive ways on his specially-equipped Honda Super Cub CT110. I literally waved him down and then fairly grilled him on the particulars of his bike. He told me Australian Post puts the bikes to auction when they get near the 30,000-kilometre mark. He suggested I look up the Postie bikes at Pickles Auctions and maybe Gumtree (similar to craigslist). There were lots to choose from. One fellow is even selling a Postie bike equipped with travel bags for $2,250 AUS. The price seems a bit steep for a 110cc bike, but oh-what-fun it could be to ride. I’ll have to grill up a toasty and give this some thought. √ Meet a Postie and ask him about his motorcycle. I’m staying with Jared and Ruth and their girls Tilly and Delilah. They’re a modern family who try to live consciously. That includes food. One member of the family is gluten-free, another dairy-free, and another meat-free, depending on the day of the week. Tonight’s meal is a fusion affair: Italian-style spaghetti bolognese with ground, organic, locally-sourced kangaroo substituting for beef. I just want a plain cup of coffee. But I discover that I must decide between a flat white and a long black. I use Google to look up the Australian version of an ‘Americano misto’ and see that a long black is an approximate equivalent, just add milk. Since I already know how to speak English, I use this language expertise to order “A long black with milk, please.” It seems to work. √ Order a long black. This long black is in a garden setting at The Farm, in South Willunga. It’s a cafe, winery, cellar door, olive grove, vineyard, and bed-and-breakfast accommodation. Pie is trash, according to a garbage can at North Sydney’s Lindfield railway station. It is foul and in need of disposing along with plastic bags, yogurt containers. and—diapers. I dispute that. Pie is a delectable, flaky pastry filled with fruits or savoury fillings. It is delightful warm and with a cup of good coffee. Pie is not akin to dirty nappies, City of Sydney train system. √ Question the wisdom of a garbage can. I was twelve years old when Peter Foldy’s 1973 song Bondi Junction played on my white plastic radio in my pink-and-lavender bedroom in Guelph, Ontario. I eventually discovered that Bondi Junction is a real place in faraway Australia. I wondered if I would ever go there. I did. It’s a transit station east of Sydney. It’s a great place to find a direct bus to Bondi Beach. But, like poor Peter, it was not the place to find love. The song did well for Peter, though. It was a Canadian’s break-out hit single nominated for several awards. He might have been influenced by three brothers he met when he was still in Australia—the brother Gibb. They’d go on to become the Bee Gees. He’d go on to direct a film that is rumoured to inspire the film American Pie. √ Catch a bus at Bondi Junction. χ Find love at Bondi Junction.